Kind Bars are healthy snack bars that are made with fruits and nuts. Kind is running a promotion where you can give free Kind bars to friends or family. Kind is known for doing nice things and it isn’t surprising that they want to help you do something nice as well. Treat a friend to a great tasting nutting kind bar. My favorite part of these bars is that they are kinda sweet and are packed with protein from the nuts. Hurry in and get these while they are available. Click the “Send a Kind Snack” at the bottom of their webpage. 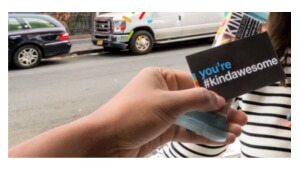 Look for the email they send you, then send the free kind bar to a friend or family member. You can also get full boxes of Kind bars on Amazon for a decent price.